For the fourth year in a row, Bass Camp Festival is bringing us a specially curated lineup set in scenic South Lake Tahoe. 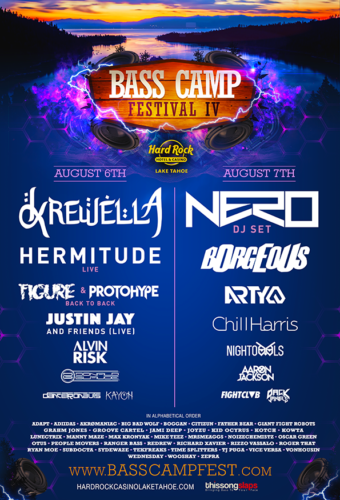 On August 6-7, 2016 at the Hard Rock Hotel and Casino in Lake Tahoe, attendees both new and old will be immersed by a variety of genres and artists, making Bass Camp a must-attend summer event. The Dancetronauts, who have been everywhere from EDCLV to Burning Man, will be present at the festival Saturday with their unique vibes, energy, and stage presence. Some of our favorites of Saturday includes an appearance from the youngest family member of Dirtybird Records, Justin Jay. Justin Jay will also be bringing some surprise friends along for the adventure, sure to be full of the funk we know and love. Following Justin Jay and Friends, is sure to be a filthy and heavy B2B from Figure and Protohype. Switching gears and another favorite is a very special live set from Hermitude. Headlining Saturday is female power-duo, Krewella, who have sold out shows worldwide and headlined events such as EDC Las Vegas. Sunday's lineup is just as jam-packed with talent including FIGHTCLVB, NightOwls, and Chill Harris. In addition, a favorite of the EPIC family, Arty, will be taking over the decks Sunday. Borgeous and a DJ set from the legendary group Nero will round out Sunday’s lineup. In addition, many local and up and coming artists will be playing throughout the festival and a full lineup can be viewed to the left. Tickets for Bass Camp Festival are selling quick, so make sure to get yours HERE, soon!